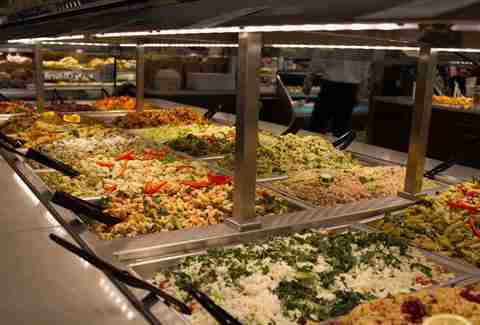 My greatest lunch-hour enemy is the per-pound salad bar at Whole Foods. The pressure of hungry cubicle dwellers waiting for their turn at the trough is real, and I always leave with a strange mix of food that costs a small fortune. 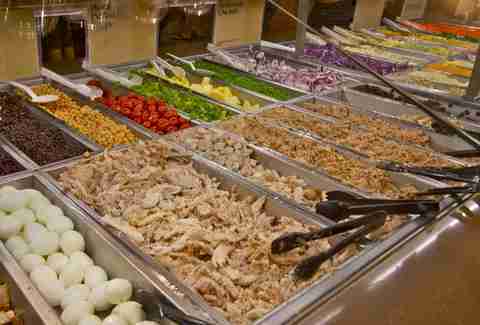 The convenience of the salad bar will always end up costing more than a DIY version. Still, you can be smart -- or get scammed. 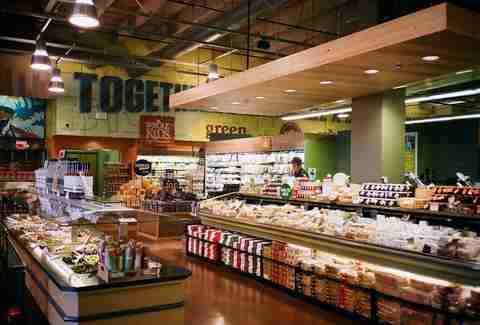 I visited my local Whole Foods in New York City, where the hot/cold bar is $8.99 per pound, to compare prices with in-store ingredients. (If you don’t live in NYC, this is also probably a lesson in crazy-high city prices.) Here's how to get the biggest health boost for your dollar, with tips from a nutritionist. Despite what you've been told your whole life, size matters. The larger the plate, the more food you'll throw onto it. There's science behind this, folks. "The nice thing about salad greens is that they're light, so make them the foundation of your tray," says registered dietitian Emily Harrison. The darker the lettuce, the more phytonutrients and iron it has. Cliché as it is, kale is packed with nutrients, and a decent deal at the salad bar since it's already expensive (a 1lb container was $6.99). Spinach ($5.49) is another good option. Romaine is the clear loser, since it's cheap on its own and doesn't quite measure up on the health side. At my Whole Foods, a dozen eggs is $3.49, or 29 cents per egg. On the small side, a hard-boiled egg weighs 50g, or about one-tenth of a pound. That means you're likely paying at least a full dollar for one egg at the salad bar. Grilled chicken is a healthy option, but skip any meat that has a bone. One of the biggest salad bar steals of all is salmon, which is full of protein and omega-3s. The cheapest fillet at the fish counter was the farm-raised one at $13.99 per pound, so you're practically making money here. Your salad should be so colorful that you'll want to Instagram it. (But please, don't be that person.) The more rainbow-like your plate is, the better it is for you, says Harrison. But be selective. Carrots, beets, cabbage -- per pound these all come in under $2, so paying $8.99 is highway robbery. Stay away from heavy fruits, and tomatoes, too. And don't even think about touching anything that's been steamed. Water weight is your salad bar enemy. Need another reason to scarf down the veggies? Harrison says they're a top way for men to prevent prostate cancer and erectile dysfunction, and possibly even to maintain overall testicular health. You’re welcome. Salad is rarely something you crave, so sprinkle on a few not-so-nutritious ingredients. "If they make a salad more palatable, go for it," says Harrison. Nuts, sun-dried tomatoes, and kalamata olives can feel luxurious, since they cost more on the shelves than they do at the salad bar. If you wouldn't go through the effort to prepare an ingredient at home, it might be worth a place on your plate. Few people buy multiple types of greens, chop up eight different items, or grill their veggies for a salad. Convenience is why you’re grabbing an overpriced lunch to sulk alone with over your keyboard, so think of it as a price justifier for that grilled broccolini or whatever it is you just threw on top of your container. If there is tuna pasta salad at the cold bar, I will put it on my plate. I blame my Midwest upbringing -- the rumors you've heard about our love for mayonnaise are true. Unfortunately, I'm committing one of the biggest salad bar sins. "Step one: avoid anything with mayonnaise," says Harrison. Not only are the pre-made items usually less healthy, they’re full of fillers like celery, onions, and oils that weigh your salad down. 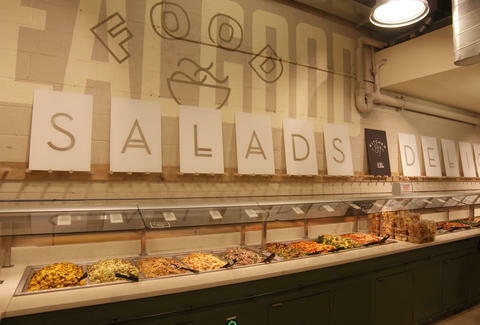 You've made it to the final salad bar step -- don't ruin it now! The heavier the dressing tastes, the heavier it is, literally. Opt for a vinaigrette. And if you can get it on the side, go for it. The cashiers usually don't ring those up. Kristin Schwab writes about health, fitness, and the arts. She plans to conquer her fear of the seemingly unlimited salad bar soon. Follow all the action on Twitter: @kkschwab.